A lot of my favorite bloggers do totally random posts. Just their musings of the week. They are my favorite and because I like doing hood rat stuff with my friends I thought I'd do one of them too. First and foremost I want to let everyone know that I am fully engaging in the challenge issued by Ellen. She has encouraged people to participate in a Dance Dare. This is where you go and dance behind someone without them being noticed. But I also love a good dance so this will be perfect. 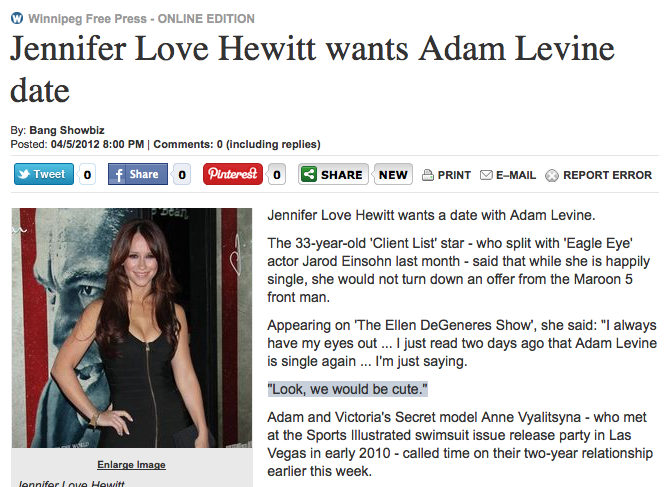 Secondly, I'm starting a feud with Jennifer Love Hewitt. She publicly admitted that she wants to start dating Adam Levine. Party of Five? How about Party of NONE! Also I'm fully engaging in my tweet campaign once again for Adam. I wanted to be respectful since he was so happy with that harlot Anne V.
But it's back on full force. I attended Wrestlmania at Valley Lanes Bowling Alley for the 2nd year in a row. Even cooler Dan came up to watch it with us. We made a pact that we were going to go see it live next year. Finally this week I stumbled upon the most frightening thing on television. Abby Lee from "Dance Moms"
She yells at these 7 to 10 year old girls so much I was at first a little confused. Was she was rehabilitating juvenile delinquents thru the art of dance? She's just a real yelly lady. She told a 10 year old, "You're not 7 anymore you're 10, get it together." She also makes them do extremely dark routines. Last week they did numbers where they were homeless, in jail, and I caught an episode where a solo number was centered around a girl being a runaway. 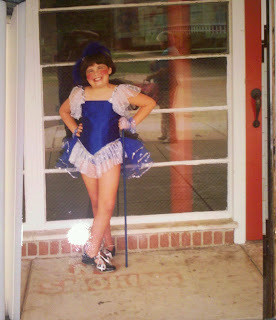 My 10 year old dancer self would not have survived. and I gotta say: I don't hate it. So there you have it, dance dares, twitter wars/campaigns, wrestling, and dance moms. Big week in the life of Ashley A. Jones. I love Dance Moms like its my job to love it! Also New series.. Dance Moms Miami.. have you seen it! ?